Ever have a an idea for a make, then struggle to execute your vision? The fabric came first, so the yardage was a limitation. 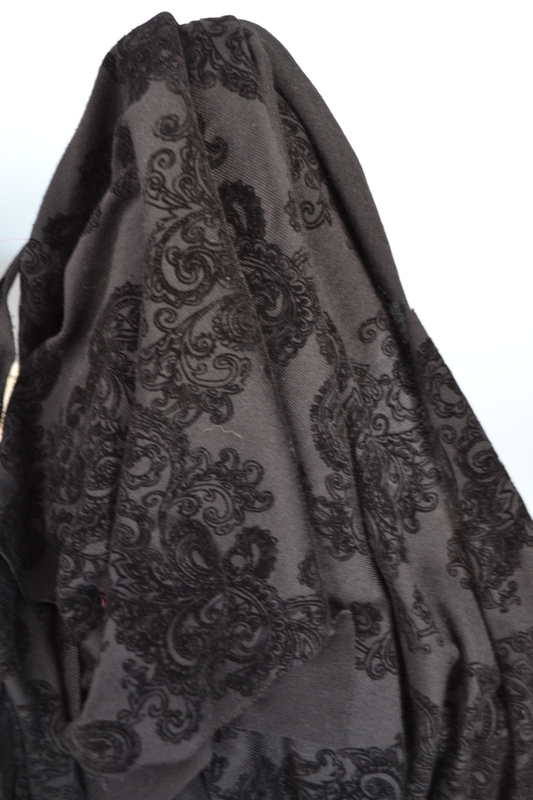 This heavy black, flocked knit was a piece, not quite 3 yards, found on the sale rack at Haberman Fabrics. It just said coat please, then it sat for a few months. Not really heavy enough for a winter coat, it took travel plans to milder climates to bring it back out and start the pattern search. I looked through my pattern stash, all my books, magazines, web sites, etc. 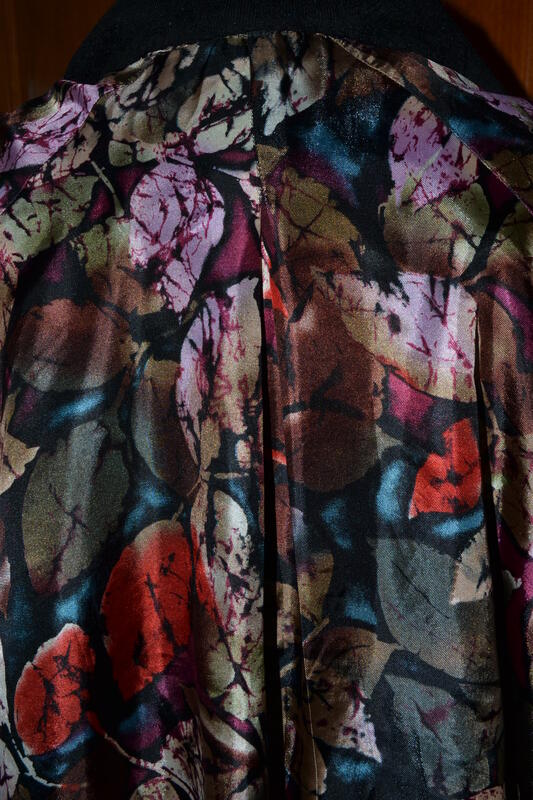 The marriage of fabric and pattern was not happening. I thought I would move on to another project, when I noticed the jacket in Vogue 8146 had the shape that I wanted, it just needed to be longer. 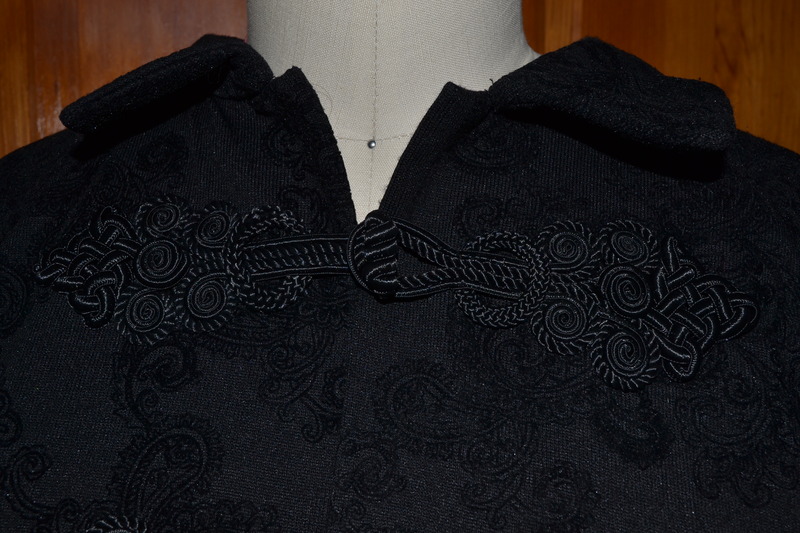 I read reviews on Pattern Review, which suggested some issues with the neckline causing it to pull down in the back. 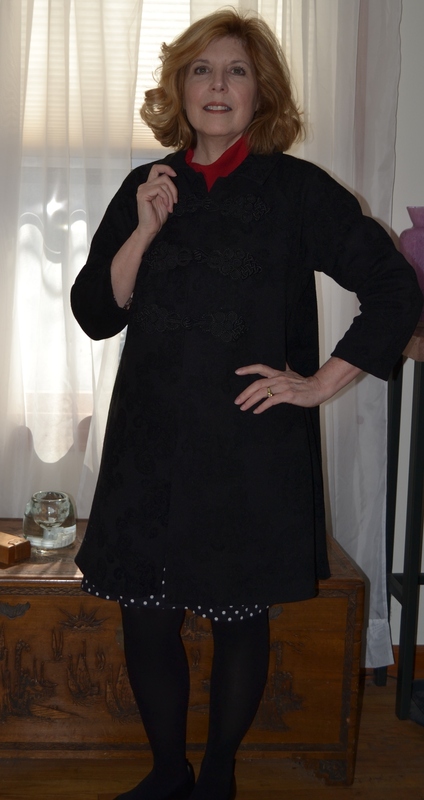 I did the muslin with the jacket length and didn’t seem to have an issue. That was likely because my muslin was, well, muslin. 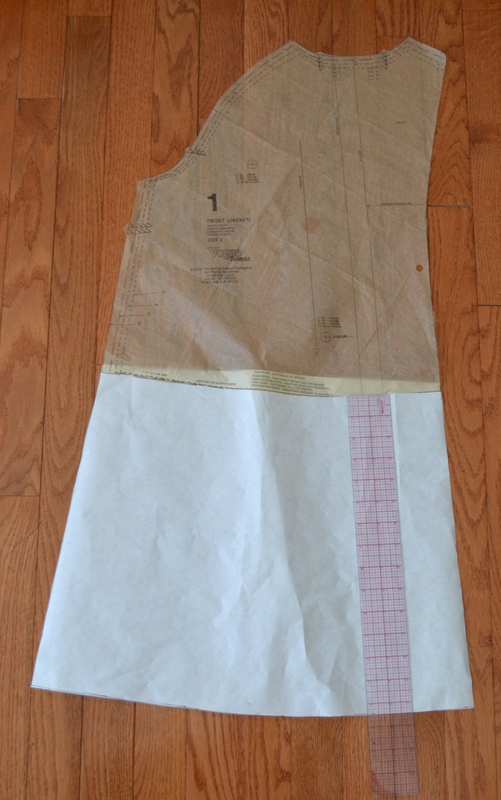 I added about 14 1/2 inches to the length by just measuring down from the cut line and using a french curve to follow the hem line. 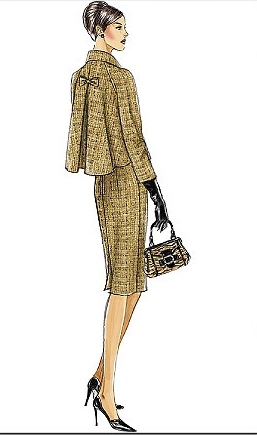 The fabric was a little drapier (okay not a real word, but you know what I mean) than would work for the coat. 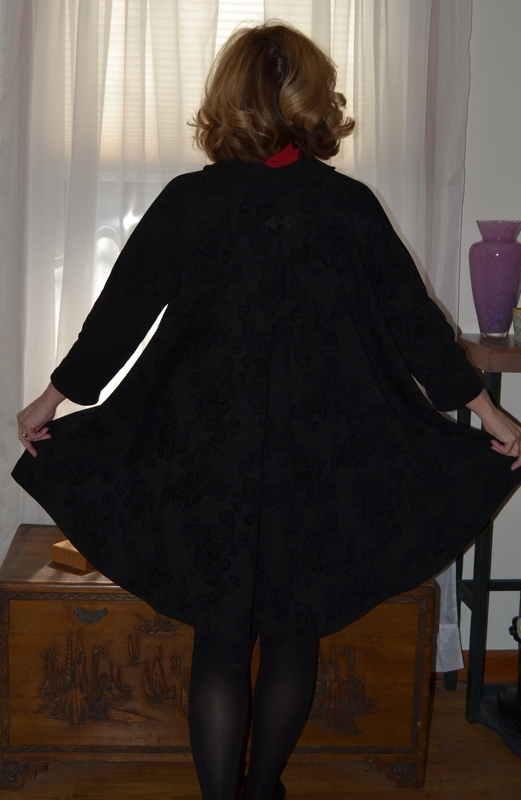 I used fusible knit interfacing to completely interface each piece of the coat and a heavier fusible interfacing for the collar, front facing and back pleat lines. 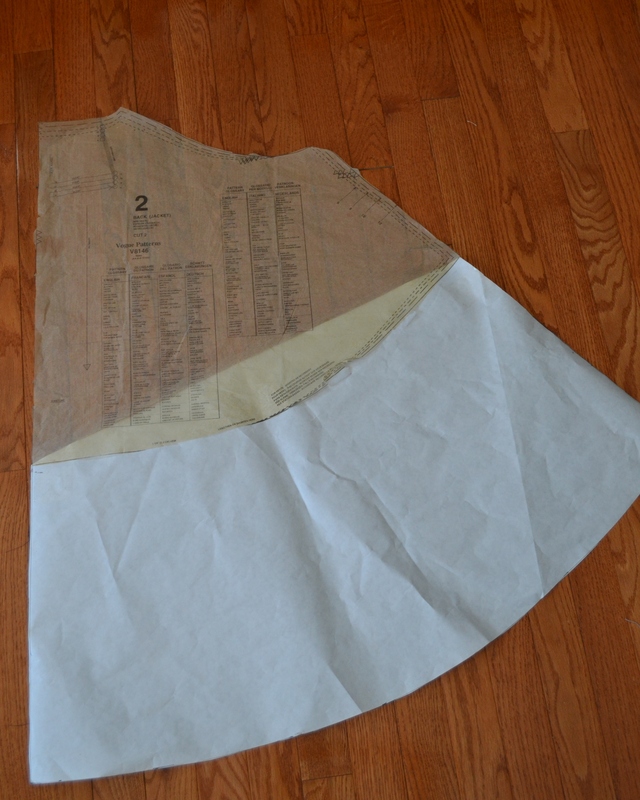 I’ve seen many blog discussions on the virtues of using quality interfacing, but I really didn’t want to spend more on interfacing than on the fabric. This was clearance fabric, I used the ordinary stuff you can buy at JoAnn’s, with a 50% off coupon of course. It actually worked pretty well. 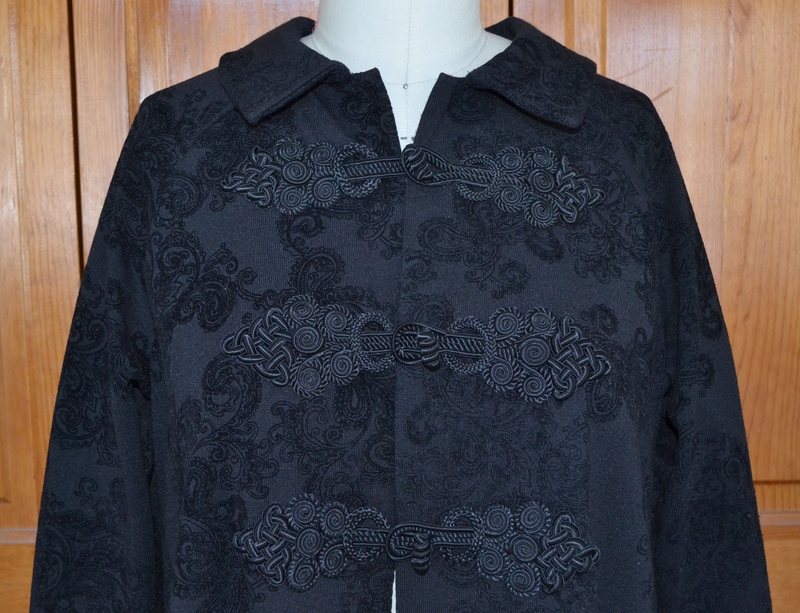 The knit interfacing and knit fabric seemed very compatible and the fabric firmer and more coat like. 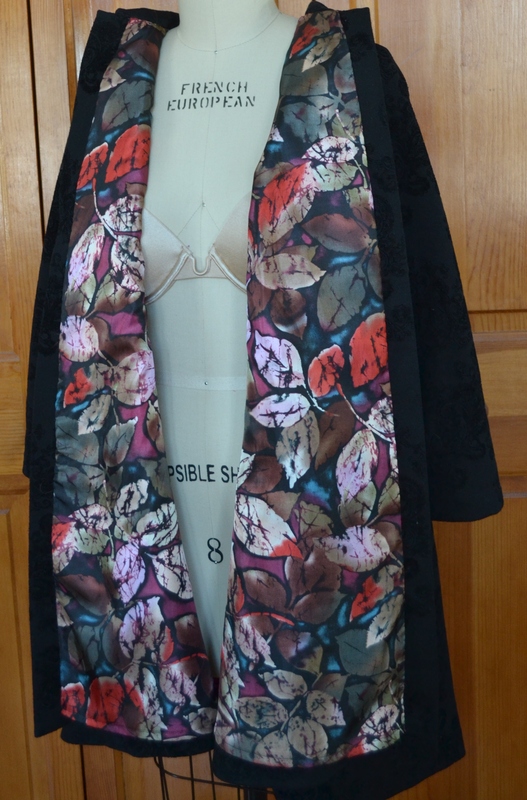 The pattern does not show a lining for the jacket, but I made one using the same pattern, allowing for less front facing and a less depth to the back pleat. 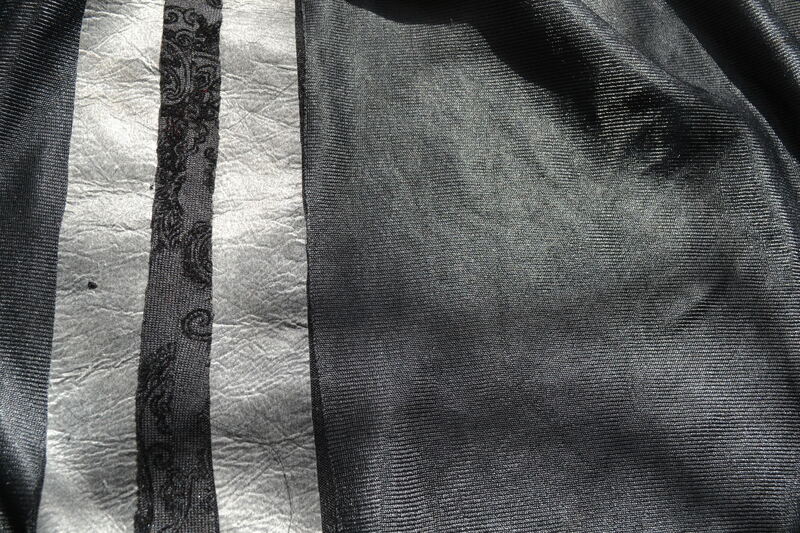 The lining was something from my stash, some sort of shiny woven. 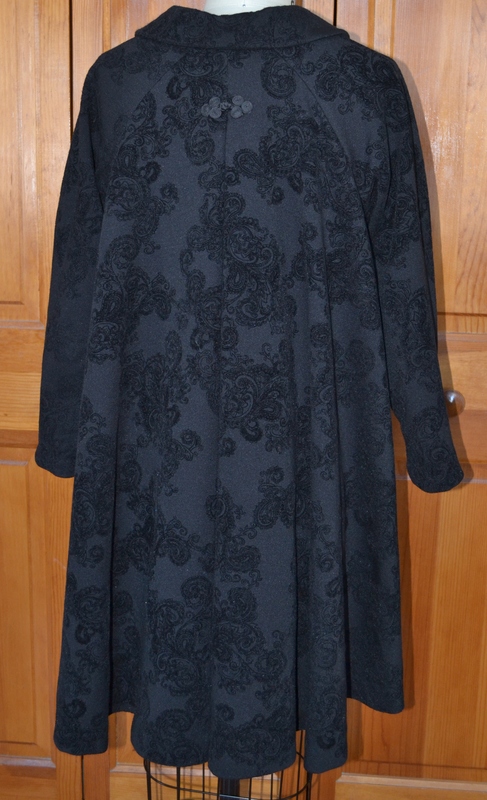 Both the black knit and the lining fabric washed well and don’t seem to wrinkle. 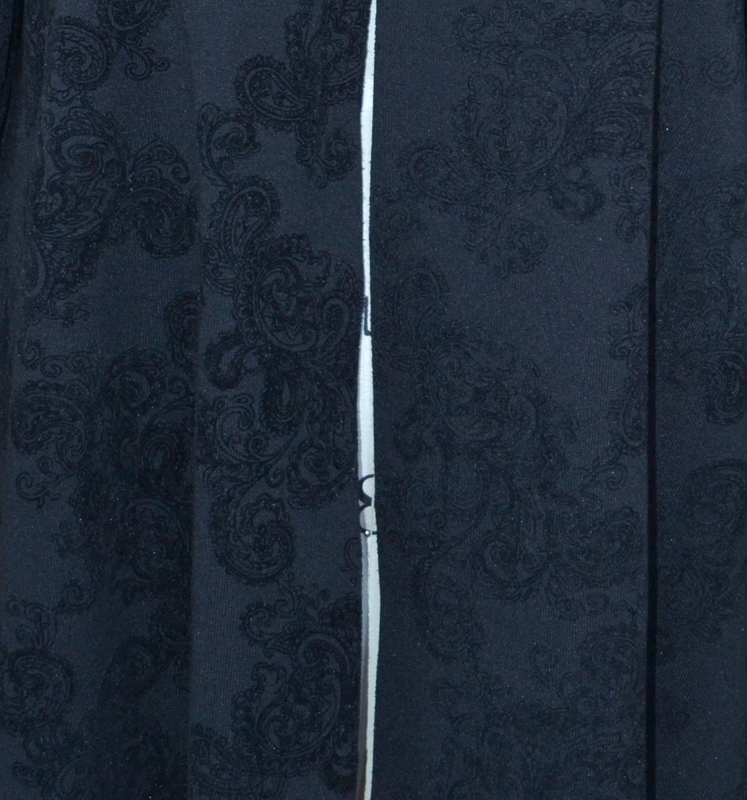 I hand stitched the lining to the coat, just because I like hand sewing. 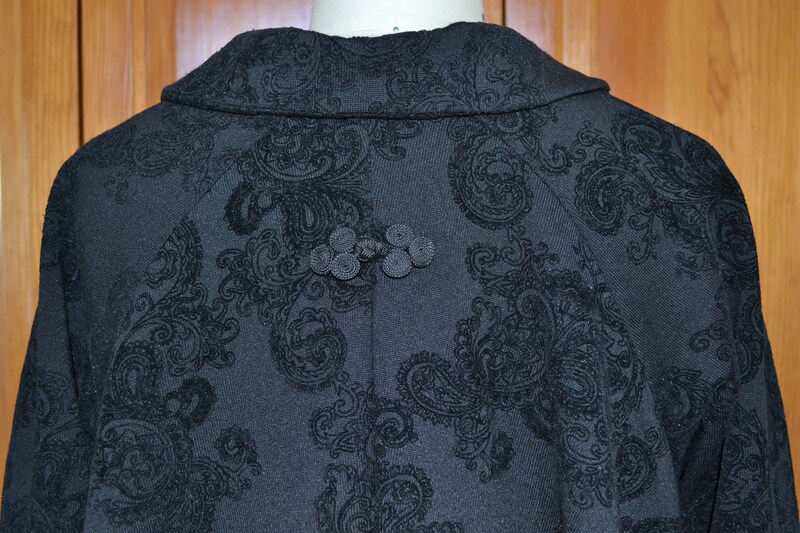 The jacket pattern shows a bow in the back and it does need some sort of detail. Luckily a small LaMode frog from JoAnn’s echoed the circles of the larger frogs and added the needed detail. I wore the coat in January to San Francisco, Northern Florida and South Carolina. It was the perfect weight for the cool, but not cold weather and comfortable for traveling. I will likely go back and add pockets, can you believe I forgot to add pockets? It does pull down in the back, yes, Pattern Reviewers you warned me. Maybe weights in the front hem would help, but removable as to not set off any alarms going through TSA screening when traveling. Now if it would just warm up in Michigan. It’s really lovely. Reminds me of a “swing coat” from the 1950s, but the fabric and those glorious frogs make it timeless! Thanks, I love the fashion of the 50’s and it finally warmed up enough in Michigan to wear it. Beautiful coat. I love the frogs on the front. Thanks, they really do make the coat. The average person doesn’t notice them, but every time I walk into a fabric store, they get comments. What a beautiful coat. The back pleats and detailing are lovely. Beautiful work. I love how you transformed the jacket into a swing coat. Timeless style and the frogs add just the right touch. Glad you are doing well and back to sewing. Thanks so much. I just found out how useful a swing coat can be. I wore the coat on a chilly flight back from South Carolina and both my husband and I were able to use it as a blanket. Very cozy. I love it! It looks gorgeous and the frogs just finish it off perfectly. Thanks, those frogs may have been a rare find. I haven’t seen any like them since and Trims on Wheels doesn’t have them on their website. I just saw some on the Internet!!! Which is why I noticed yours. I had them in my basket and then couldn’t decide what I would use them for!!! I might have to add to my basked again?!?! Oh my, in almost every color! Great resource, thanks. I bought them months before I knew what I would make. The perfect fabric will eventually appear. 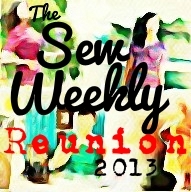 Love what you did with this pattern – I just ordered it from ebay – thanks so much for posting!